Java 7 has this new watchservice which is a welcome development and you can read about it in many blogs as well as the oracle site. I tried playing with it using the code sample from some of the blogs. But unfortunately it seemed to work only the very first time and not after that. Some more beating around the bush and googling I discovered that the WatchKey needs to be reset for subsequent events to flow through to the listener. Wonder why this strange behaviour. Anyhow here is the fix and after that everything was fine and dandy! Audio files have inherent characteristics like number of channels, sample size, frame size, sample rate, file type, number of samples, etc. to quote a few. Here is a nice description of samples and channels from the java sound faq. Each second of sound has so many (on a CD, 44,100) digital samples of sound pressure per second. The number of samples per second is called sample rate or sample frequency. In PCM (pulse code modulation) coding, each sample is usually a linear representation of amplitude as a signed integer (sometimes unsigned for 8 bit). There is one such sample for each channel, one channel for mono, two channels for stereo, four channels for quad, more for surround sound. One sample frame consists of one sample for each of the channels in turn, by convention running from left to right. Each sample can be one byte (8 bits), two bytes (16 bits), three bytes (24 bits), or maybe even 20 bits or a floating-point number. Sometimes, for more than 16 bits per sample, the sample is padded to 32 bits (4 bytes) The order of the bytes in a sample is different on different platforms. In a Windows WAV soundfile, the less significant bytes come first from left to right ("little endian" byte order). In an AIFF soundfile, it is the other way round, as is standard in Java ("big endian" byte order). frameSize is the number of bytes in each frame of a sound that has this format. sampleRate is the number of samples played or recorded per second, for sounds that have this format. More definitions can be found here. Audio files are made up of samples and samples are made up of bytes. Audio files come in two types, mono and stereo. Mono files have only one channel (perhaps was recorded with one receiver). Stereo audio files can have from two to as many channels. Mono audio files when played, samples from the single channel are automatically duplicated and sent to all the channels. For example if speakers are attached to a computer, that would be two channels.In the case of a stereo audio file, it is pre-recorded for multiple channels. Now what if you want to interleave two different audio files into one audio file such a way that each audio file is played on separate channels. There are many possible use cases for doing that. One could be to get the remix effect. For example you can take a song and mix it with some background music or add some percussion effect. Of course there are many sophisticated audio software out there which can do this and much more. But the goal here is to demonstrate a simple java program to achieve interleaving of audio files. Here I am going to take two mono audio files of the same format (wave file), encoding (PCM) and sample rate. Interleave them to produce another wave file with different audio playing on each channel. I am using Java Sound API for this exercise. Java supports only AU, AIFF and WAV formats. Extensions/plug-ins for MP3 and other audio formats are available through 3rd party vendors. Here is the main method of the class. File fileLeft = new File(soundFileLeft);   // This is the file we'll be playing on the left channel. The interleaving of audio bytes is done in mixIntoStereoAudio method as shown below. In this case the sample has two bytes. In a stereo audio file samples are written out in the following fashion. First sample for left channel and second for right and so on. This example uses a simple technique of filling a sample from each audio file for each channel respectively.Filling in silence value whenever we run out of samples from an audio file. This is because the two audio files being interleaved might not have the same number of samples. This technique can be extended easily to handle stereo audio files or list of audio files for each channel. Go ahead and run this program with the sample audio files provided or you can just listen to how the interleaved output file plays out. The complete program and sample audio files are available here. Some good resources on using Java Sound API are listed below. You don't need a hardware device (like Lantronix adapter) to route data from a Serial port to a socket. Thanks to socat, you can relay data from a serial port to another or serial port to a socket or socket to socket and plenty more such combos, all in one line! socat is exhaustive in what it can take as arguments. Check it out. Here is an example of making available data from serial port /dev/ttyS0 on a linux environment (usually this is COM1 on windows boxes) through a socket (port = 8023). The baud rate specified here is 9600. fork option lets you make multiple connections to the source of data, which in this case is the serial port. You can verify the data from the socket by using a telnet or similar application. Serialports have gone out of vogue! You no longer get serial ports on a computer except on Desktop PCs, unless you custom order it. Notebooks/Laptops, no such luck. But there there are many people and companies which deal with serial ports on a daily basis. In the windows world we had the good old Hyperterminal program which was shipped with all windows distributions until recently. Now Hyperterminal is a payware utility and can be purchased separately. No free utility available out there for windows! But then in the linux world, things are friendlier. There is minicomm and many more free utilities that come with the operating system. Well the point of this blog post is not to berate windows or anything. Just wanted to share a way you could look at the data coming in from a serial port without downloading/purchasing any software. This is very handy for troubleshooting, say if you are looking for any control characters or any noise in the serial line, etc.All this while an app is running using the serialport. This can be done outside the app space to monitor activity on a serial port. To see the data from a serial port on command line as well as save it to a file here is what you can do. The script command writes data from a terminal to the specified output file. 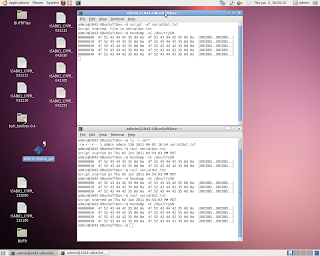 The top window shows the output from the terminal and the bottom one shows the contents of the output file in real time. You can do this and much more on a windows platform too! By installing cygwin and running linux commands within the cygwin environment. The default drive for installing an application on a windows system is C. In fact on launching the .msi or .exe installer file it does show you the complete path where the package will be installed. but if you preset the drive to say D on the .aip file, the msi installer chokes on boxes where there is no D drive. The fix here is to create some custom action and execute the custom action as part of the install/uninstall sequence. See the custom action screen snapshot below. Here we set the value for APPDIR property pointing to D drive if the condition D_DRIVE holds true. The INSTALL_DIR property is set in the Install parameters tab as shown below. Last but not the least is defining the D_DRIVE condition. Following the above steps should enable you to install on D drive or for that matter any drive (if it exists) by default. Unable to login to Ubuntu. Screensaver unresponsive! Generally I don't power off my machine at the end of the day or for that matter anytime unless there are updates that prompt me to restart. Also I leave firefox ON with 10-15 tabs! So the system is ON for weeks sometimes even a month or two! Ofcourse some of the processes start getting slower and slower. especially Firefox. But then all I need to fix that is to restart Firefox. But in the last 6 months or so I have been encountering this weird problem. when I come to work the next day...many times I couldn't get to the login dialog screen, no matter how hard I tried with the mouse or keyboard. Seemed like the gnome screen saver had gone into the weeds! The machine was ON and everything was running. The solution to this is to login through a command line session CTRL-ALT-F6 and kill the gnome-screen saver process. 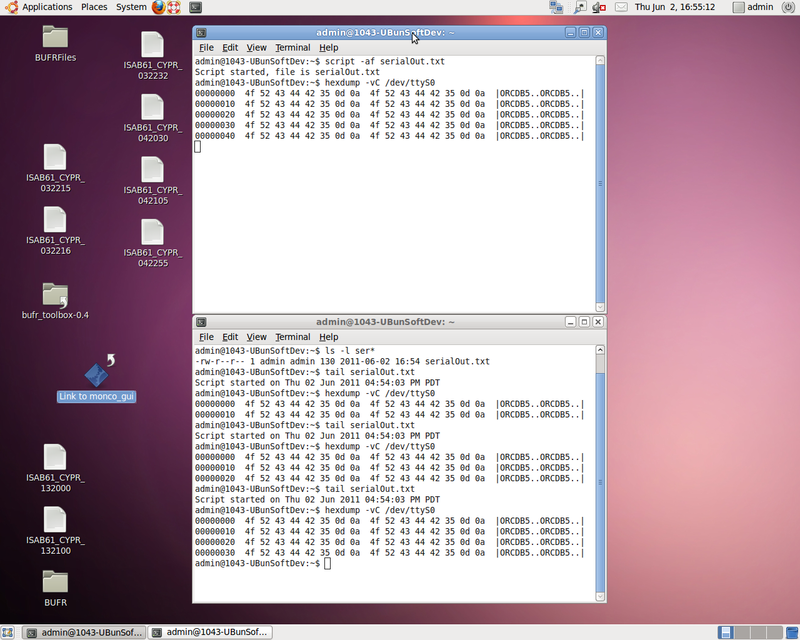 I used top utility to find the process id (look for gnome-screensaver in the command column) and also kill it. and then try ALT-F7 and everything is fine.